The white sturgeon that set a new catch-and-release record in Idaho was so big that it required four anglers to reel it in. At least that’s how it looks in the record books with four fishermen taking credit for the 117-inch-long fish. White sturgeon are among the biggest and oldest fish in North America. Because they are so heavily protected, keeping records can be tricky as guides want to release the fish as soon as possible and officials don’t want to encourage harming the animals by weighing the giant fish. In most states, like Idaho, the catch-and-release records are taken with a measuring tape and a photograph. Then they estimate the weight. Caught on the snake river on Aug 16, the new Idaho record holder fell short of being the largest white sturgeon ever caught in North America. That distinction technically belongs to Joey Pallotta, who caught a 468-pound white sturgeon in Benicia, California in 1983. But that was before the fish was protected. 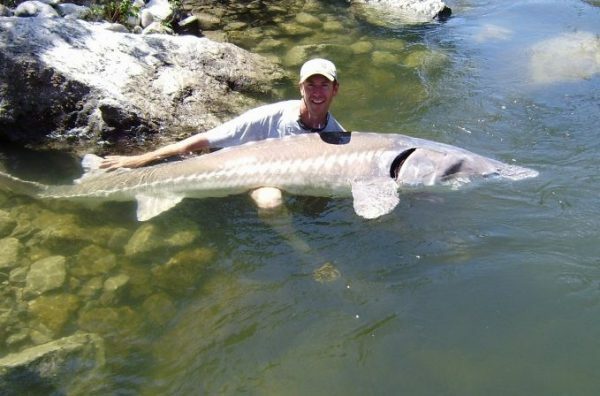 The actual honor of catching the world’s largest white sturgeon goes to Michael and Margaret Snell from England who caught and released a 12-foot, 1,100 pound estimated white sturgeon in 2012 on the Fraser River in Canada, a renowned hotbed of sturgeons. Just a few years later another giant sturgeon more than 11 feet long, estimated to weigh to 880 pounds, was caught on the Fraser by a 19-year-old. For many anglers, landing a sturgeon is a thrill of a lifetime as the massive fish is known to put up a fight that can last for hours. Before you head out looking to get your name in the record books be sure to check with your local fishing regulations. See our guide to catching sturgeon here.